To celebrate its 40th anniversary, bag-maker Lowepro has introduced the $280 Primus AW, an all-weather camera backpack designed for professional photographers. At last week’s PMA digital photography conference in Las Vegas, I had the opportunity to get a closer look at the new bag, and I have to say I was impressed. Not just because the bag was designed to be environmentally friendly—it’s made from 51 percent recycled material, the equivalent of 22 soda bottles—but also because of the attention to detail that went into its design. 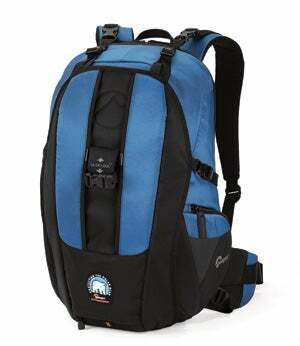 The bag’s camera compartment can hold a professional digital SLR with attached zoom lens, plus two other lenses or flashes. You can reach your camera via a small opening on the side, for quick one-handed access without taking the bag off, or via a larger zippered opening on the back, which adds extra security. The bag includes a weatherproof cover with heat-sealed seams, an adjustable tripod support, and additional compartments for personal items and accessories. The Primus AW will be available this summer. Ten percent of proceeds from the bag will be donated to Polar Bears International, a non-profit group aimed at conserving the world’s declining polar bear population through research and education.